Vasiliki Penna, née Athanassopoulou, was born in Kyparissia (Peloponnese) in 1951. She studied Archaeology and History of Art at the Aristotle University of Thessaloniki and received in 1991 her DPhil from the University of Oxford, UK, Wolfson College, where she studied with a scholarship from the Onassis Foundation (Dissertation title: Byzantine Monetary Affairs during the 8th, 9th, 10th and 11th centuries, supervisor D. M. Metcalf, examinors Cécile Morrisson and Bryan Ward-Perkins). It provided the core of an important article “Life in Byzantine Peloponnese: The numismatic evidence (8th-12th c)”, in Μνήμη Martin Jessop Price (Athens, 1996). For twenty-three years (1974–1998) she served in the Archaeological Service of the Hellenic Ministry of Culture, in Eastern Macedonia and Thrace, in the islands of Northeastern Aegean (Chios, Lesbos, Lemnos) and in the Numismatic Museum, Athens, where in 1994 she was appointed as a Deputy Director. During her tenure in the Archaeological Service she participated in excavations, reconstructions, museological assignments, as well as in research programmes and in the organization of scientific conferences. In 1997–1998 she served as vice-president of the Association of Greek Archaeologists. 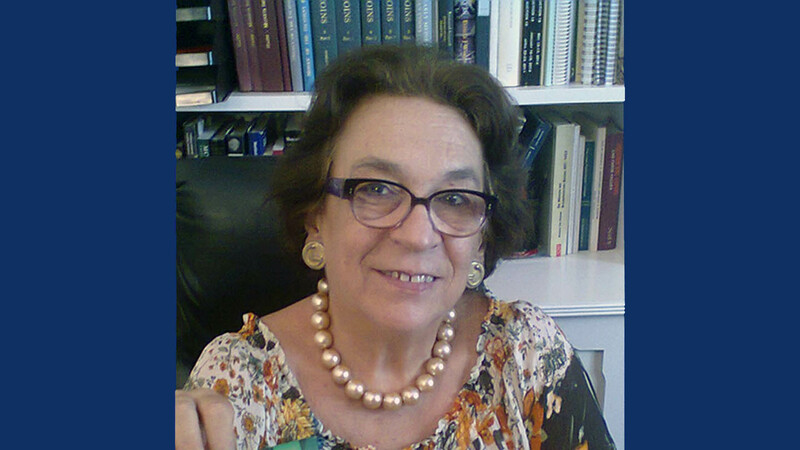 She taught Byzantine Numismatics (1991–2005, 2011–2014, 2016–2018) for the ‘Historical Sciences Seminar’ and gave several lectures for the ‘Nikos Oikonomides Postgraduate Seminar’, both organized by the National Hellenic Research Foundation (EIE). She also gave a series of seminars and lectures at the Universities of Oxford, Athens, Ioannina and Corfu. She taught Byzantine History and Art (1998–2006) in acknowledged exchange programmes in public universities of the United States (Penn State University, AHA, UCLA). She cooperated with the Open University of Greece as an academic supervisor, a reviewer and the writer of Byzantium and Hellenism and Public and Private Life in Byzantine and Postbyzantine World. She also lectured on the theme “Byzantine and Western World” at the same institution (2000-2004). Furthermore, she was a member of PhD examination committees in the Universities of Oxford and Sorbonne. In 2003 she started teaching at the Department of History, Archaeology and Cultural Heritage Management of the University of the Peloponnese (Kalamata); in 2006 she was appointed Assistant Professor in Byzantine History, Numismatics and Sigillography and by 2017 she became full Professor. Her research and tutorial activities were centered on the economic and numismatic history of Byzantium, on aspects of historical geography and local history (particularly employing numismatic and sigillographic evidence), as well as on Byzantine prosopography, society and institutions. She was also interested in the economic and numismatic history of ancient Greece and in the history of money through the ages. She organized exhibitions both in Greece (Benaki Museum, Gennadeion, Bank of Greece Athens; Tellogleion, Thessaloniki) and abroad (Smithsonian Institution, Washington, DC; Kunsthistorisches Museum, Vienna; Fondation Martin Bodmer, Geneva; Pushkin State Museum of Fine Arts, Moscow), in collaboration with the KIKPE Foundation, aiming at the promotion of numismatics and of monetary history as products of cultural heritage. She was Visiting Senior Research Fellow in the Department of Byzantine and Modern Greek Studies at King’s College (London) for three academic years (2009–2013). She was invited at Dumbarton Oaks (Washington, DC) to chair and teach together with Dr Eric McGeer, the Byzantine Coins and Seals Summer Program 2015. She published three monographs and more than sixty-five papers in Greek and international scientific journals, while she also edited five collective volumes; she edited and co-authored the Sylloge Nummorum Graecorum. Greece 7: The KIKPE Collection of Bronze Coins, Vol. I, Athens: Academy of Athens, 2012. She was also associated with the Foundation for Social and Cultural Affairs / KIKPE as its Advisor for the Numismatic Collection from 2003 through 2018. She took part in many scientific conferences in Greece and abroad and she gave a great number of lectures over the years. After fighting against illness over the last three years, Vasso Penna passed away on May 17th, 2018. She is greatly missed by her family, friends, students and colleagues.